The performer pours liquid into a glass from a soda bottle. He "absent-mindedly" lets go of the glass during the performance, and the glass stays suspended in mid air, as the liquid continues to pour. 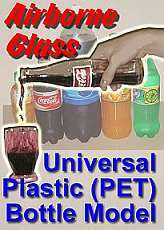 This model is designed for use with any standard plastic soda bottle with screw on cap. (Coke, Pepsi, Fanta, Sprite, etc) of any size from 8 oz. to 2 L. We supply you the gimmicked clear glass and the special gimmick. Use them with any regular soda bottle.